EZ-Crank® adjustment allows for adjustments of 10'to 5'6"
The Force offers infinite adjustability, exceptional rigidity and maximum durability for the serious basketball players. A tough 5" square, 3/16" thick walled vertical post and dual strut extension arm make this system a real powerhouse. The bolt down anchor system makes the system easy to remove for storage. EZ-Crank® adjustment makes it easy for players of any age to change the rim height. Adjustable anywhere from 6.5' to 10'. The rim height indicator shows the height of the rim. The Spring Assist® reduces the effort needed to crank the height up, particularly benefitial when smaller people will be adjusting the height of the rim. A wide variety of backboard and rim options are available. COMPARED TO OTHER MANUFACTURERS: 5" post systems by other manufacturers have LESS post to board extension and their lifetime warranty is a LIMITED warranty and does NOT cover intentional hanging on the rim. 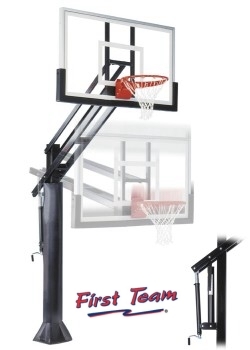 First Team 5" systems provide 48" of extension for safety and a LIFETIME SUPERIOR warranty covers intentional hanging on the rim by multiple players. First Team systems are the "Lexus/Mercedes" of basketball systems. SHIPPING: Other dealers will offer a higher, set price and include shipping. I can typically beat those prices by $150-350 when I price the system out at a reasonable mark-up and take the time to calculate EXACT freight to your location. Volume shipping rates apply to multi-unit purchases. Manufacturer policy prohibits showing our low price. Fill out and submit this form to receive IMMEDIATE initial pricing. Additional discounts on unit price and/or freight apply for multi-unit purchases. I will follow up with more information based on your specific interest and ship to zip code. MAKE SURE TO INCLUDE YOUR EMAIL ADDRESS or PHONE.